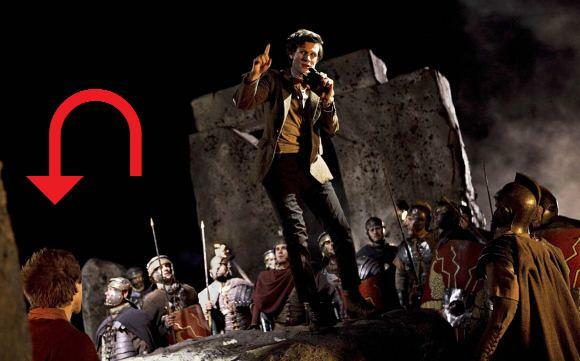 The Pandorica Will Open — Snippets of Speculation, III. Prisoner Zero, as it impersonated the Doctor and Amy from when they were inspecting the crack in Amy’s bedroom wall, said that Amy was “still such a child inside.” And the Doctor kept telling her in The Eleventh Hour, whenever she said that she thought she’d grown up, that he’d “soon fix that.” It’s been established that that part of Amy, that little girl inside her — probably the little girl that did see the Doctor returning when she was outside: waiting in the garden, with only her cloak over her nightgown — is vital to her relationship with the Doctor, and vital to the cracks and the Pandorica, the things “the Doctor in his TARDIS doesn’t know.” I bet that, in the end, Steven Moffat will look quite smugly at us, the audience, and say, “Well, the clues were all there to be had!” Curse you, Moffat! And THAT is so absolutely gorgeous Rory’s head! PreviousThe Pandorica Will Open — Snippets of Speculation, II.